This entry was posted in Bike Advocacy, Bike Paths, Provo Bicycle Projects by Jamie. Bookmark the permalink. yay! Those look great! Building bike infrastructure is a process that only works if you get started trying things and finding out what’s best for your city. This is a wonderful start. 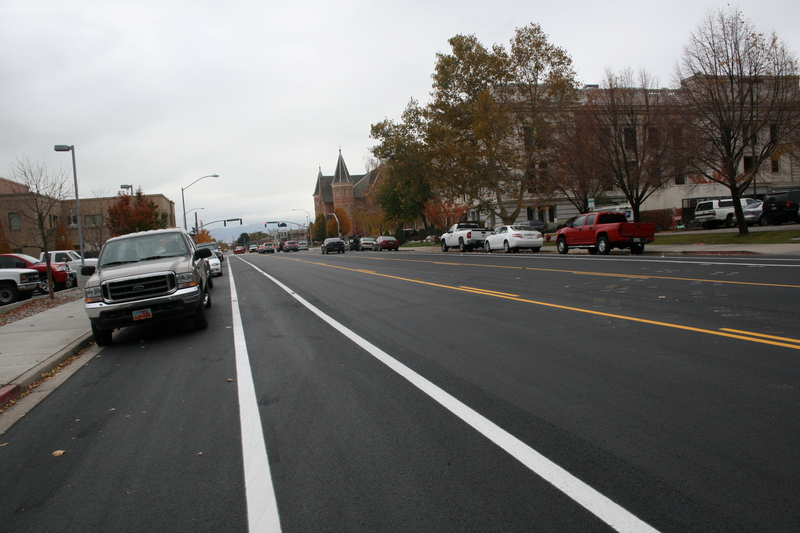 It would be great to see a network of bike lanes installed on secondary streets like 100 S that would allow cyclists to get from one side of Provo to the other without having to brave utahs infamous commercial streets. I’d love to see some of Provo’s streets narrowed and more trees put in, and then maybe some great big sharrows! I live right around the conner for 100 s and i am really enjoy the new bike lanes. Thanks Zach. Thanks Jeff. But the real praise goes out to the City Council, Engineers, and all the citizens that spoke up to have bikes be a higher priority. Yeah for Provo and bicycles.